Leadership coach Susanne Madsen shows that leaders need to be visionaries and tells you how to inspire and motivate you team. We expect our leaders to be visionaries, Susanne said, which means inspiring and motivating your team. She offered these practical tips to help achieve those goals. Follow these tips and not only will you be a better leader, but you’ll make better decisions and add value to the project. Pro-Tip: Other things that really motivate people include being certain. While certainty can get in the way if it crosses into arrogance, team members don’t thrive with uncertainty. Hi, I’m Susanne Madsen. 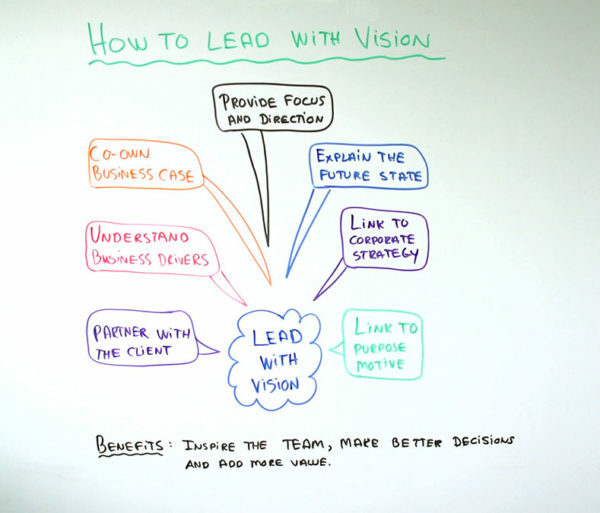 Welcome to this whiteboard session on How to Lead With Vision. According to “Harvard Business Review,” enlisting others in a shared view of the future is the attribute that most distinguishes leaders from non-leaders. What that means is that we expect our leaders to be visionary, but we don’t necessarily expect that from our co-workers. When you lead with vision, it means that you’re really good at inspiring and motivating your team to help you implement the project’s mission and thereby deliver the project’s objectives and benefits. Let’s look at how you can do that. The first step really is for you to partner with your client. If this is your client, many project managers see themselves as being less important. They almost subordinate themselves. They see themselves as subcontractors. But for you to lead with vision, you’ve got to truly partner. Because if you truly partner with your client, you’re able to ask the real questions about, “What is this project going to do for your business?” You need to understand everything that’s in your client’s head and you can really only do that if you truly partner. This means that you need to understand all the business drivers and you need to co-own the business case with your client. I’m not saying that you must own the business case all on your own. Co-own it with your client and convey that picture, convey those business drivers to your team, so that you can begin to provide that vision and direction. And link it to corporate strategy, link it to a client’s corporate strategy because everybody likes to work on projects that give meaning and purpose and that’s why you need to link it to the purpose motive. Why might each individual team member want to help you implement this vision? Because there’s something in it for them. They find it motivating.